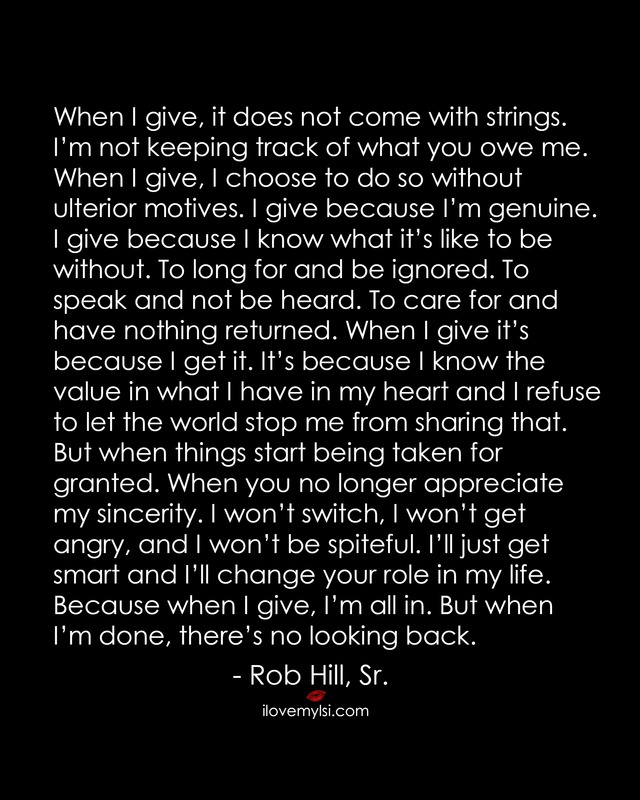 When I give, it does not come with strings. I’m not keeping track of what you owe me. When I give, I choose to do so without ulterior motives. I give because I know what it’s like to be without. To long for and be ignored; to speak and not be heard; to care for and have nothing returned. When I give it’s because I know the value in what I have in my heart. And I refuse to let the world stop me from sharing that, But when things start being taken for granted, When you no longer appreciate my sincerity, I won’t switch, I won’t get angry, and I won’t be spiteful. I’ll just get smart, and change your role in my life. Because when I give, I’m all in. But when I’m done, there’s no turning back. – Rob Hill, Sr.
Beauty is having a pretty soul.